Fabian Coulthard has won Race 10 of the Virgin Australia Supercars Championship at Phillip Island after a mysterious loss of time in pit lane for team-mate and runner-up Scott McLaughlin. Shell V-Power Racing pulled off a one-two for the seventh time in the eight sessions at the WD-40 Phillip Island SuperSprint although Penrite Racing’s Anton De Pasquale did make life hard for them in the first half of the 45-lap race. De Pasquale had enough fuel to get home in a personal best third position in a slightly nervous finish, while three Tickford Racing-run Mustangs in those of Will Davison, Chaz Mostert, and Cameron Waters, followed. Shane van Gisbergen (#97 Red Bull HRT ZB Commodore) was second-best of the Holdens in seventh, while Rick Kelly held off two charging Brad Jones Racing entries to deliver an eighth position in his #15 Castrol Altima for Kelly Racing. Jamie Whincup gradually drifted to 12th over the 200km journey while Mark Winterbottom (#18 Irwin Racing ZB Commodore) was 17th. Pole man McLaughlin and Coulthard once again all but matched each other when the lights went out but the latter tucked in earlier than he had a day before, doing so before they got to Doohan Corner, as De Pasquale moved into third from Davison. Mostert and Waters needed almost as far as Siberia to sort themselves out, where the #55 Supercheap Auto Mustang took a hold on fifth position, while Todd Hazelwood was unloaded by James Courtney just behind them. McLaughlin (#17 Mustang) was 1.5s up on Coulthard (#12 Mustang) when he took his first pit stop on Lap 5, during which time he was passed in the lane by Waters owing to taking on a reported 51 litres of fuel versus 22 litres for the #6 Monster Energy Mustang. Coulthard and De Pasquale were into the pits two laps later and they too swapped positions due to #12 being filled with 58 litres and the #99 ZB Commodore with 36 litres. More significantly, they re-entered the race track ahead between Waters and McLaughlin, the latter of whom lost time transiting the pits for reasons unknown. 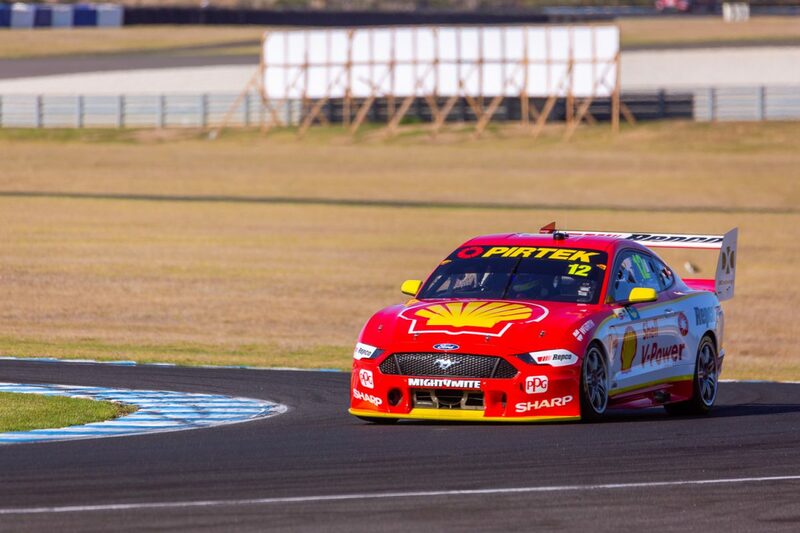 “It’s a bit of an odd one, but their total pit transit time for both cars is about two seconds difference,” said DJR Team Penske managing director Ryan Story during the race. Mostert, meanwhile, jumped to the top of those who had made their first pit stop by being filled with 19 litres of fuel only and not changing tyres. De Pasquale was giving second-placed Waters some attention on Lap 16, with Coulthard just behind and McLaughlin closing back in on them, before the pole-sitter took his second pit stop at the end of that lap. Mostert and Waters pitted a Lap later, after which De Pasquale still had Coulthard on his tail until the Erebus Motorsport driver pitted at the end of Lap 18 and rejoined a few lengths ahead of McLaughlin. Coulthard came in on Lap 19 and rejoined in 16th position but effectively leading the race, from De Pasquale, McLaughlin, Davison, Mostert, and Waters. McLaughlin seized second position on Lap 20 when De Pasquale couldn’t get Car #99 turned into the Southern Loop, at which time the Ford man jammed his car up the inside and made slight contact on his way by. The DJR Team Penske Mustangs started gapping De Pasquale again as Davison (#23 Milwaukee Mustang), who had pitted with Coulthard, staved off Mostert for what was effectively fourth position. Waters followed a bit further back and van Gisbergen, who waited until Lap 23 to complete his compulsory pit stops, was back where he started in seventh position, behind the same top six cars albeit shuffled in order somewhat since the race began. With Hazelwood’s and Courtney’s woes, which included a penalty for the initial contact and multiple further tyre blowouts for the Mobil 1 Mega Racing driver, there was change behind them. Kelly held eighth after the second pit stop cycle but was under pressure from Nick Percat (#8 7-Eleven ZB Commodore), who pitted two laps later, and David Reynolds, who pitted another four laps later. It was Tim Slade, however, who took his second pit stop at the end of Lap 30, that came home with a really wet sail in the #14 Alliance ZB Commodore. He took advantage of the battle ahead to pick off Reynolds into Siberia on Lap 41, then got BJR team-mate Percat through the final corner on the race track a lap later. Coulthard ran about a second ahead of McLaughlin for the last 10 laps or so to take a first win since Winton last May, while De Pasquale had a scare with slightly higher fuel consumption due to a gear sensor problem but still made the finish. “I’m pumped,” said the victor. “Awesome for all my guys. We work so hard as a team; Scott’s had a lot of wins this year which is a credit to all those guys, they’ve done a fantastic job. “To finally get one is awesome, I can’t thank my crew enough, Shell V-Power, all my sponsors. It’s fantastic. “A little bit,” he said about the perhaps surprise nature of the result. “You know, I was a little bit shocked, I’m not sure what happened to Scott on one of his out laps because I was expecting a red car to go blowing past. Reynolds ended up 11th in the #9 Erebus ZB Commodore, about a second up on Whincup (#88 Triple Eight ZB Commodore), while Hazelwood (#35 Matt Stone Racing ZB Commodore) was 16th and Courtney dead last and two laps down in the #22 ZB Commodore. McLaughlin’s championship lead over Coulthard is therefore as it was at the start of the weekend, 124 points, while Mostert moved up to third on the table courtesy of his fifth position in Race 10. The next event is the Pirtek Perth SuperNight at Barbagallo Wanneroo Raceway on May 2-4.